Inspired by the new issue of Saveur, which is devoted to the food of India, I'm feeling in the mood for some succulent curry. At the same time, I'm craving more fried chicken. I want a piece of fried chicken wedged into a fresh, warm biscuit. But I also want the pungent punch of cardamom, cumin, ginger, chile and garlic. So here's what the old scavenger is going to attempt: an experimental combination. Warning: this could go horribly awry! I'm making a chicken marinade based loosely on a recipe for Parsi-style chicken with apricots from the aforementioned mag. The Parsis, South Asia's ethnically Persian population- followers of the prophet Zoroaster- carry a beautiful cuisine that frequently pairs sweet fruits with savory herbs. Place chicken in a glass dish or Pyrex storage container with a cover, pour the marinade over, mix with hands, cover and refrigerate up to 24 hours. 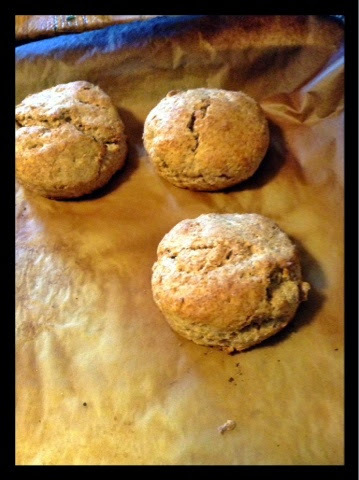 Quick Cream Biscuits (recipe from the Anson Mills website). Or use your favorite biscuit recipe. After trying this, I recommend a more rugged biscuit that can hold up to rough treatment. Anticipating the coating on this chicken to be pretty sweet from the jam, I'm making a quick onion pickle to offset the sugars. Mix ingredients, cover and let rest at room temperature an hour, then store in fridge if necessary. Mix dry ingredients in large bowl. 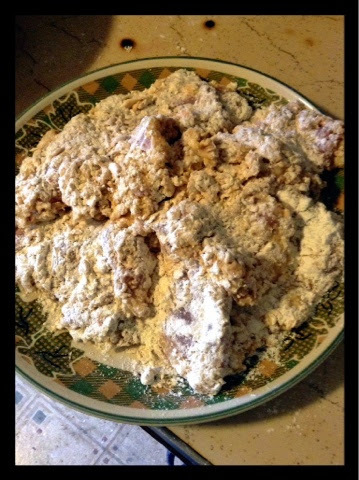 Remove chicken from fridge, shake off excess marinade and dredge well in flour mixture. Fill 12 inch cast iron skillet with 1/3 to 1/2 inch oil and heat to 350. Place chicken in skillet, skin side down first. Cook chicken til it turns golden brown, 4-5 minutes per side. Don't crowd the skillet, fry in batches, if need be. Let cooked chicken rest for a few minutes on baking sheet lined with paper towels. Ok, the chicken turned out pretty well, but these biscuits are not meant to hold a hot chunk of bird-they are soft and crumbly. Delicious, but better to save them as vessels for butter and preserves. We need to find a more stalwart biscuit next time. 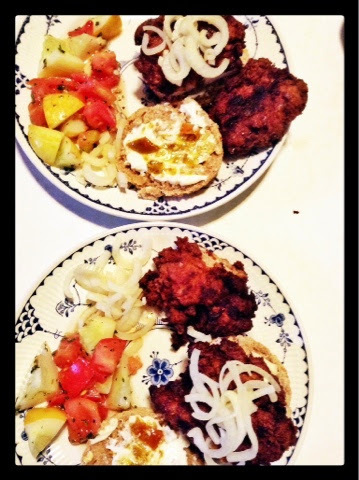 We had to pull an open-faced maneuver: a little mayo on bottom half of biscuit and a dab of chile pickle, then the chicken and pickled onion. We buttered the top half and ate it separately.